New Delhi: Seven opposition parties led by the Congress laid out five charges against Chief Justice of India Dipak Misra in the impeachment notice submitted to Vice President Venkaiah Naidu on Friday. Raising questions about Misra’s conduct, the parties accused him of “misbehaviour” and “misuse” of authority and said that nothing had changed in the three months since four senior judges of the Supreme Court held a press conference in January. Congress leader Kapil Sibal said the notice for impeachment had been moved with a heavy heart. “As representatives of the people, we are entitled to hold the Chief Justice accountable, just as we are accountable to the people. The majesty of the law is more important than the majesty of any office,” he said. The notice bears the signatures of 71 MPs, of which 64 are sitting MPs in the Upper House. The MPs who signed the notice belong to the Congress, the NCP, the CPI-M and CPI, the SP, the BSP and the Indian Union Muslim League (IUML). The leaders of these parties earlier met in Parliament and gave the final shape to the notice for impeachment. 1. The first charge levelled against the CJI by the opposition parties is a “conspiracy to pay illegal gratification” in the Prasad Education Trust case and the denial of permission to proceed against a retired high court judge in the same matter. The original case pertains to a Medical Council of India issue. The MCI had denied permission to Prasad Education Trust, an institution based in Lucknow, to run a medical college. The Trust then moved court and obtained an order in its favour. The CBI raided several people related to the case based on allegations that there was collusion between the Trust and the judiciary. The impeachment notice says that it on record that the CBI has registered an FIR in the case. “There are several recorded conversations between middlemen, including a retired judge of the Orissa High Court, excerpts of transcripts of which are set out in the articles of charge. References to the Chief Justice by innuendo in these conversations are evident. The denial of permission to the CBI to register an FIR against Justice Narayan Shukla of the Allahabad High Court, when the CBI shared incriminating information with the Chief Justice was itself an act of misbehaviour. All this requires a thorough investigation,” the notice reads. Finance Minister Arun Jaitley today accused the Congress party of trivialising the power of impeachment and using it as a political tool. In a scathing Facebook post, the senior BJP leader said the 114 page judgement in the Judge Loya death case authored by Justice D Y Chandrachud on behalf of the three Judge Bench of the Supreme Court “exposes every fact of the conspiracy” to generate falsehood as propaganda in the public and political space. Referring to the move of Congress and six other opposition parties to impeach Chief Justice of India Deepak Misra, Jaitley said: “The Congress Party and its friends have started using impeachment as a political tool”. Stressing that trivialising the use of power of impeachment is a “dangerous event”, he said the move is an attempt to “intimidate” a Judge and send a message to other Judges, “that if you don’t agree with us, fifty MP’s are enough for a revenge action”. The Supreme Court said it was “very disturbed” at the course of developments involving public statements by the Members of Parliament (MPs) on the removal of the Chief Justice of India (CJI). The apex court said it was “very unfortunate” that despite knowing the law that till a certain point, the issue of impeachment cannot be made public, the politicians were holding public discussions. The move came a day after the apex court rejected the pleas of those, including Congress leader Tehseen Poonawalla, seeking an independent probe into the death of special CBI Judge B H Loya, who was hearing the high-profile Sohrabuddin Sheikh fake encounter case in which BJP President Amit Shah was discharged by the court. 1) SC disturbed at MPs raising CJI impeachment issue in public: The Supreme Court today said it was “very disturbed” at the course of developments involving public statements by the Members of Parliament (MPs) on the removal of the Chief Justice of India (CJI). The observations were made during the hearing of a petition, a few hours before the Congress and other opposition parties submitted a notice to Rajya Sabha Chairman M Venkaiah Naidu for initiating impeachment proceedings against CJI Dipak Misra. The apex court said it was “very unfortunate” that despite knowing the law that till a certain point, the issue of impeachment cannot be made public, the politicians were holding public discussions. 2) Loya won’t be forgotten, there is hope as millions can see truth, says Rahul: Congress President Rahul Gandhi today said India will not allow judge B H Loya to be forgotten and millions of Indians can see the truth. His remarks came as the Congress and six other opposition parties moved a notice for impeachment of the Chief Justice of India, a day after the apex court rejected pleas for a probe into the death of Loya, who was hearing the Sohrabuddin Sheikh alleged fake encounter case. “‘There is no hope left, everything is managed’ say Judge Loya’s family. I want to tell them, there is hope. There is hope because millions of Indians can see the truth. “India will not allow Judge Loya to be forgotten,” he said on Twitter. 3) Manmohan Singh does not sign notice for impeachment of CJI: Former Prime Minister Manmohan Singh is not among the 71 Rajya Sabha members who have signed the unprecedented motion for impeachment of Chief Justice of India Dipak Misra. Neither are other senior Congress leaders P Chidambaram and Abhishek Singhvi. “We didn’t involve Manmohan Singh intentionally as he is an ex-PM,” said Congress leader Kapil Sibal. 4) Jaitley accuses Congress of using impeachment as a political tool: In a scathing Facebook post, Finance Minister Arun Jaitley said the 114 page judgement in the Judge Loya death case authored by Justice D Y Chandrachud on behalf of the three Judge Bench of the Supreme Court “exposes every fact of the conspiracy” to generate falsehood as propaganda in the public and political space. Referring to the move of Congress and six other opposition parties to impeach Chief Justice of India Deepak Misra, Jaitley said: “The Congress Party and its friends have started using impeachment as a political tool”. 5) Opposition parties meet to firm up impeachment motion against CJI Misra: Opposition parties led by the Congress today met Vice President and Rajya Sabha chairman M Venkaiah Naidu and handed over a notice for impeachment of Chief Justice of India Dipak Misra. According to sources, over 60 MPs of the Rajya Sabha belonging to seven political parties gave the notice for the impeachment against the CJI. The MPs who signed the notice belong to the Congress, the NCP, the CPI-M and CPI, the SP and the BSP. The leaders of these parties earlier met in Parliament and gave final shape to the notice for impeachment. After the meeting, Leader of Opposition Ghulam Nabi Azad confirmed that the leaders were moving the notice for impeachment against CJI. 6) Congress, SP, BSP, others working on impeachment motion: The Opposition parties expected to attend the meeting to discuss the impeachment motion include the Congress, the Samajwadi Party, the Bahujan Samaj Party, the Rashtriya Janta Dal, the Communist Party of India, and the Nationalist Congress Party. 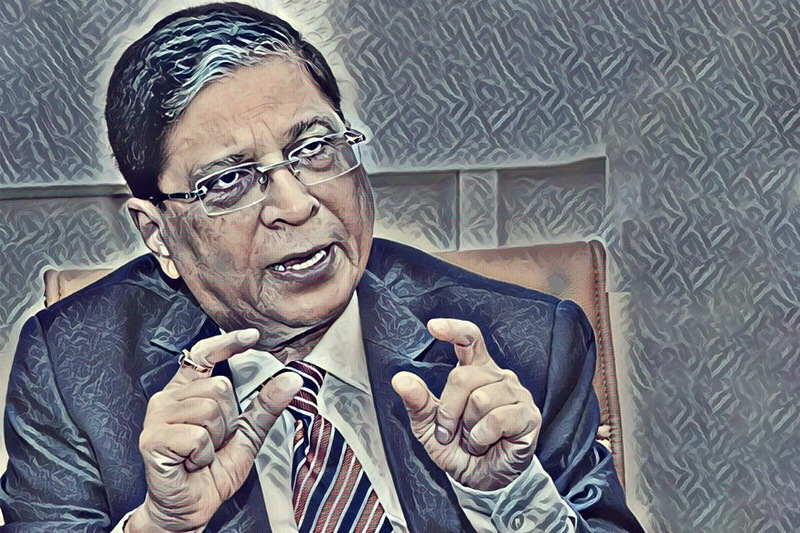 7) Even before Loya verdict, Congress had said impeachment option against CJI was open: The Congress earlier this month had said that the option of moving an impeachment motion against CJI Misra was still open and had added that it would be a very sad day if the Opposition has to take that step. “We are very very concerned about what is happening in court (in the Supreme Court). The issues, which were raised by four SC judges, have not been addressed yet. We believe the option (impeachment) which is available to us is still open,” senior party leader and noted lawyer Kapil Sibal had told reporters. “We are as concerned about the independence of the judiciary as anybody else, but we want to protect the institution. We mean the people of India must protect this institution from the kind of gross interferences by the government and be protected also from within. So, we have to wait. This is a serious matter and if we think about it, calmly, coolly, look at all the possible consequences and then come to a conclusion,” he added. 8) After signature collecting drive, Congress had kept move on hold during Budget session: During the Budget session, which concluded earlier this month, the Congress had initiated a move collecting more than 50 signatures of Rajya Sabha members in a bid to table the impeachment motion against CJI Misra. However, there were reservations from parties like the Trinamool Congress. Subsequently, the Congress kept the move on hold, saying that it wanted to get as much support as possible from other parties. 9) Justice Chelameswar says CJI impeachment can’t answer all problems in judiciary: Justice J Chelameswar, who had earlier courted controversy by virtually revolting against CJI Misra, earlier this month had said that impeachment cannot be an answer to every question and problem, adding that there was a need to correct the system. Justice Chelameswar, the senior-most judge after the CJI, said the January 12 press conference he held along with justices Ranjan Gogoi, M B Lokur, and Kurian Joseph, was the result of “anguish” and “concern” as their deliberations with the CJI did not achieve the desired results on the issues raised by them regarding the functioning of the top court. “The other day, someone was asking for my impeachment. I don’t know why this nation is worried about impeachment so much. In fact, we (along with Justice Gogoi) wrote in the judgement of Justice C S Karnan that apart from that, there must be mechanisms to put the system in order. Impeachment can’t be the answer for every question or every problem. A few days ago, I heard somebody asking for my impeachment. Like the saying goes, I don’t agree with you but I shall protect your right to say so,” he said. a) To move an impeachment motion against the CJI, the signatures of 100 MPs are needed in the Lok Sabha and the signatures of 50 members are required in the Rajya Sabha. The motion can be introduced in either of the Houses. b) After the motion is introduced, it will be up to the Speaker of the Lok Sabha or the Chairman of the Rajya Sabha to accept it. In this case, it would be up to Sumitra Mahajan and Venkaiah Naidu, respectively. c) If the motion is accepted, a three-member committee, comprising one Supreme Court judge, one judge of the high court and one notable jurist, would be formed to further investigate the charges. d) If the three-member committee further decides to support the motion, the matter will be taken up for discussion in the House where it had been originally introduced. The impeachment process will get passed only when either 100 Lok Sabha MPs or 50 Rajya Sabha members support the motion. e) Irrespective of which House introduces the motion, according to the Indian Constitution, it will have to be passed by the other House as well. Only after gaining a two-thirds majority in both the Houses will the motion finally get passed to the President of India. f) If the motion is passed in both the Houses, then the President will take the final call. How did the talk of an impeachment motion against CJI Dipak Misra begin? The talks of an impeachment motion came after Justices J Chelameswar, Ranjan Gogoi, M B Lokur, and Kurian Joseph in January this year held a press conference and issued a statement to say that the situation in the Supreme Court was “not in order” and that many “less than desirable” things had taken place. They had said that “democracy will not survive in the country” unless the institution was preserved. Next How the Delhi Police Trace 3,000 Missing Children In 4 Days?